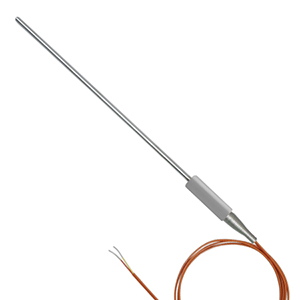 For long life, drift-free operation, choose Super OMEGACLAD™ XL mineral insulated thermocouple cable and our rugged transition joint probes, which are available in Type K and N calibrations. Notes: *Specify Junction: (G)rounded, (E)xposed or or (U)ngrounded. **Specify length in inches: 6 for 150 mm (6 in. ), 12 for 300 mm (12 in. ), or 18 for 450 mm (18 in.). Super OMEGACLAD™ XL probes (highlighted in yellow) are also available in N calibration; substitute NT for KT in Model Number. Some Type E devices are also available. See ordering examples below and contact Sales for moe info. Type K Molded Transition Joint Probe with Super OMEGACLAD™ XL 1/16 in. (1.5 mm) dia. sheath, ungrounded junction, 12 in. (300 mm) length. Type K Molded Transition Joint Probe with 304 SS 3/16 in. (4.5 mm) dia. sheath, ungrounded junction, 12 in. (300 mm) length. Type K Molded Transition Joint Probe with Inconel® 1/4 in. (6 mm) dia. sheath, ungrounded junction, 12 in. (300 mm) length. Type J Molded Transition Joint Probe with 304SS 1/8 in. (3 mm) dia. sheath, ungrounded junction, 12 in. (300 mm) length. Type E Molded Transition Joint Probe with 304SS 1/16 in. (1.5 mm) dia. sheath, ungrounded junction, 12 in. (300 mm) length. Type T Molded Transition Joint Probe with 304SS 1/4 in. (6 mm) dia. sheath, ungrounded junction, 18 in. (450 mm) length. Note: For extended lead wire beyond 1 m, add $1 per foot (300 mm). Contact Sales or see the Spec Sheet for prices on additional lengths of MI cable. Prices for 6 and 12 in. (150 and 300 mm) probes are the same.